French President Nicolas Sarkozy has been holding talks in Moscow with the Russian President Dmitry Medvedev about the crisis in Georgia. He is joined by the EU foreign policy chief, Javier Solana, and the European Commission head, Jose Manuel Barroso. 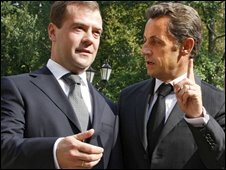 Mr Sarkozy was pressing Russia to meet the terms of the ceasefire agreement and withdraw its troops from Georgia. Russia says the deal allows it to keep peacekeepers in several buffer zones around two breakaway Georgian regions. Ahead of the talks, Mr Sarkozy said the EU was "united" in its position, adding that "we will defend our convictions forcefully". France currently holds the rotating presidency of the European Union. Mr Medvedev said "all necessary efforts" had been undertaken to "conform strictly with the Medvedev/Sarkozy plan". Russian troops, including tanks and heavy artillery remain in South Ossetia and a self-declared buffer zone within Georgia after responding with force to Georgian attempts to recapture the separatist region last month. They show little sign of heeding European demands to withdraw, the BBC's Rupert Wingfield-Hayes reports from South Ossetia. Just ahead of Mr Sarkozy's visit, Russia appeared to reject an EU proposal to place its own observers in the region. The foreign ministry said it would cause the "superfluous fragmentation" of the monitoring already provided by the UN and the Organisation for Security and Co-operation in Europe (OSCE). Russia also threatened to end all co-operation with Nato if it granted Georgia membership, Moscow's envoy to the alliance, Dmitry Rogozin, was quoted as saying by Russian news agency RIA Novosti. Nato did not grant Georgia Membership Action Plan status earlier this year, but said it would eventually join, a position repeated more recently by European and US officials. As Mr Sarkozy arrived in Moscow, reports from Georgia said Russian troops had turned back a UN convoy. Our correspondent says that every single Georgian village on the road south from the Russian border now lies in ruins. Homes, shops and schools have been looted and in one village Georgian homes have even been bulldozed. "The Georgians are beasts," one Ossetian woman said. "God forbid they ever come back". Some European leaders have already warned there can be "no business as usual" with Russia until the peace plan is fully implemented, and the European Union has suspended talks on a new partnership agreement with Moscow. However, with winter approaching, individual European countries continue to consume Russian oil and gas as usual. BBC diplomatic correspondent Jonathan Marcus says Russia's recognition of Abkhazia and South Ossetia as independent states, and its continuing failure to implement the truce agreement to the letter, will have profound consequences for Russian relations with the EU. It will also make it difficult for President Sarkozy to achieve his goals in Moscow, he says. The French president will travel on to the Georgian capital, Tbilisi, to meet President Mikhail Saakashvili, following his talks in Russia. Meanwhile, Georgia has gone to the UN's highest court over what it claims are Russian human rights abuses. Judges at the International Court of Justice (ICJ) in The Hague are being asked to impose emergency measures to halt what Georgia says is a campaign of ethnic cleansing by Russia in the breakaway regions of South Ossetia and Abkhazia. If the court decides it has jurisdiction to hear the case, it can issue an interim protection order to help safeguard civilians. A final outcome on the case could take years. Russia has not responded directly to Georgian claims, but when Georgia began its military action in South Ossetia last month, Moscow accused it of committing crimes against humanity. Russian investigators have released a list of 311 names of South Ossetians killed during the five-day war with Georgia. Initially, Russian and South Ossetian authorities had estimated at least 1,400 fatalities. The Russian-language list given on the website www.osetinfo.ru details their names, ages and causes of death. The authors note that the list is not final.